Samson's Concert 77 Series of wireless systems represents an incredible value. Offering solutions for any wireless demand - from guitar/bass systems to handheld microphones - the Concert 77 Series features the half-rack CR77 wireless receiver at its heart. As a True Diversity system, it constantly polls its receivers and locks into the strongest signal, so you don't have to worry about problematic drop outs. What's more, onboard squelch control eliminates carrier signal noise and interference with the your Samson Concert 77 Series wireless system. The Concert 77 system includes a Samson LM10 omnidirectional lavalier microphone for clean, clear transmission wherever you need vocal amplification. Just plug it into the CT7 bodypack transmitter, and you're ready to go wireless! This system is dead simple to operate and it's so light you might forget it's there. The Concert 77 system employs the powerful and reliable CT7 UHF transmitter with a 1/4-wave antenna. Combined with the MT350, it provides the ideal solution for your active playing needs. The system is incredibly compact and comfortable to wear. Plus, it's simple to use, with an on/off switch and a level control. The Concert 77 Series' CR77 wireless receiver gives you the dropout-free reassurance of a true diversity system. The CR77 constantly polls its two receivers and locks into the strongest signal. It's available with any one of six UHF frequencies. The CR77 is rugged, durable, and crystal clear, with an impressive range. It brings you sophisticated wireless technology at a great price. 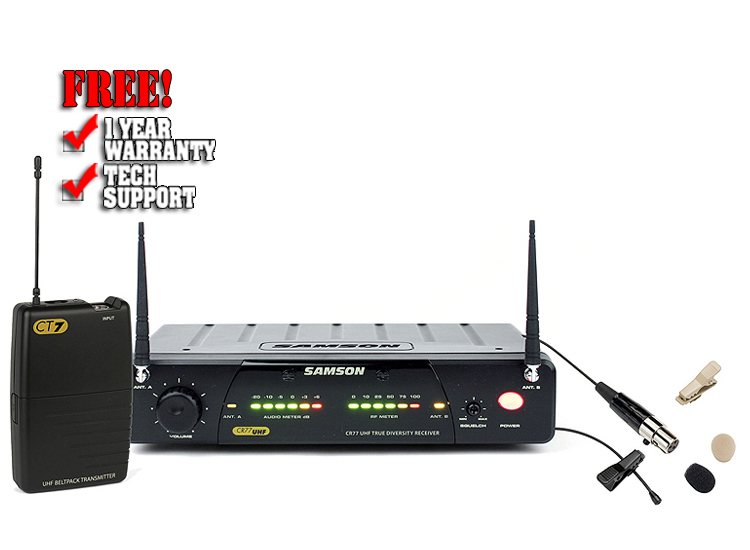 The entire line of Samson Concert 77 wireless systems deliver pro-quality UHF wireless that any group can afford!